Business View Magazine interviews Brett Drexler, General Manager of Ice Castle Fish Houses, as part of our Top Innovative Manufacturing/Retailer series. Move over cold, lonely fishing hut… and say hello to the ultra-tweaked, state-of-the-art, Ice Castle Fish House on wheels. These customized recreational vehicles act as a home-away-from-home for ice fishing on the frozen tundra; hunting in the fall; or in the role of a luxury camper. Family-owned American Surplus & Manufacturing (AS&M), better known as Ice Castle Fish Houses, has come full throttle; starting out as a small shop in 1993, and growing to become the largest manufacturer of premium portable ice fish houses in the state of Minnesota. To date, Ice Castle has built over 20,000 units. Drexler notes that 80 percent of the models they are building now are pre-sold; retail orders received at the plant by email from a large dealer network. Clients are spoiled for choice with over 40 different models to choose from. At present, the bestselling fish house model is the 8’x16’ Lake of the Woods Hybrid and the bestselling RV model is the 8’x17’ Ice Castle RV Edition. The customizable aspect of what is essentially a motorhome continues to wow consumers and competition, alike. Designs are available to accommodate every fishing lifestyle through an amazing menu of options. A large bay window in the rear? Satellite TV? The basic Ice Fish shack can be converted into a luxury Ice Fish House home, and all models have maintenance-free aluminum siding. 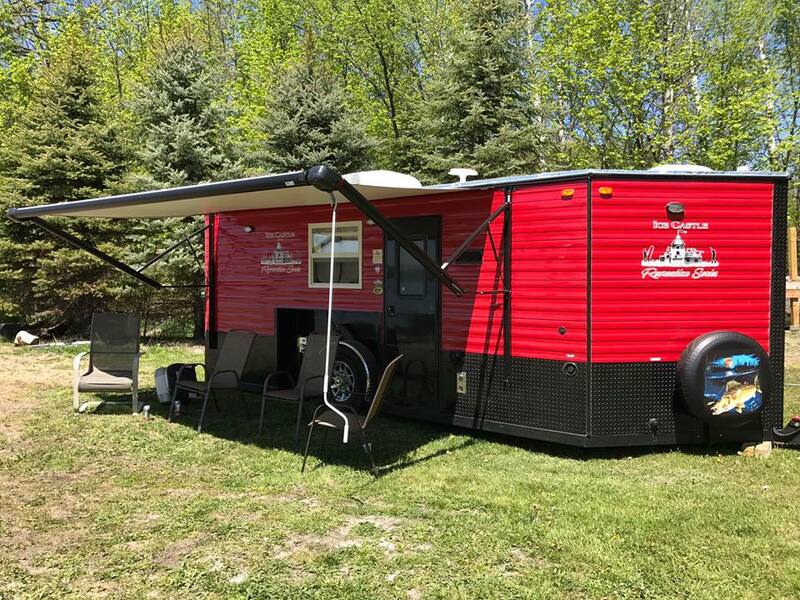 Even better, the road-licensed Ice Fish House features deluxe double-pulley suspension with retractable wheels, so it can be used year-round; as a hunting shack in the fall, or a trailer for hauling snowmobiles, four wheelers, motorcycles and other toys in the winter, spring and summer months. The company has grown from 8-12 employees at its inception, to 160 employees during peak demand. Presently, about 130 people are on the payroll. With success comes the need for expansion, and Ice Castle is always on the grow. A 12,000-square-foot addition is in progress; one of numerous additions incorporated into the facility over the last five years to keep up with the growing demand. One of the reasons for the ever-increasing sales is attention paid to improving the product in practical and innovative ways, such as incorporating urethane insulation, which many other camper outfits do not. The Ice Castle Arctic Package features urethane insulation under the floor, the ceiling, and the walls to improve the comfort level and lower the heating cost. Drexler has several great ideas for growing the business, and a strong passion to see them through. “In the next few years, I would like to stretch our demographic reach more into the west. More of the rugged areas like Colorado, Utah, and I’d like to attract more of the elk hunters. And even down south, with the amount of hunting that goes down. Basically, these can be mobile hunting shacks. So, I’d like to see what we can get into there. We’ve had a lot of auctioneer companies approach us to build auction toppers and off-clerking trailers, because I know there aren’t many people doing that anymore and there is a growing market. “We have a separate business, Greater Minnesota Rentals, where we rent out about 25 shacks throughout the winter on Red Lake. But the bulk of our business is sales. In fact, one of our dealers just sold 35 units over a weekend. That’s pretty good for what you would call an ice house. Many of our exclusive features, and perhaps the greatest advancement of RV certified models, have come from AS&M listening to customer/dealer input. Adding AC units at customers’ request triggered adding water and wastewater holding tanks, which set us into motion to earn the RVIA certification in 2010. Providing an All-Season RV, equipped with the right materials to handle harsh weather conditions is a product we are proud to offer. We’re seeing more and more people discovering the benefits of Ice Castle over just owning a standard RV. Here, they don’t have to pay insurance for two different items; they don’t have to make payments for a fish house and a camper. You’re all in one.